But, Harmon gets more out of the game than just fun and exercise. The twelfth grader has high functioning autism, and the game he loves is also helping him with his social interactions. “He’s been obsessed with Pokemon all of his life,” his mother Jenna Russell said. “Pokemon Go” forces the player to get out of the house and explore their surroundings. In Kansas City, it’s hard not to see people out on the Plaza playing and clustering together at hotspots. “It lets me know that they’re more open to talk to me,” Harmon said. Harmon can spout off fact after fact on Pokemon without missing a beat, but he can find social interactions hard because he doesn’t have the same instincts that other people have. He finds some conversations forced and uncomfortable. Harmon isn’t the only kid getting more out of the game. Even Pokemon creator, Satoshi Tajiri, has high functioning autism but doesn’t talk about it openly. Maybe that’s why his game has been able to reach so many people around the world. But experts like Joshuaa Allison-Burbank, a speech pathologist at KU Medical Center, have some concerns. 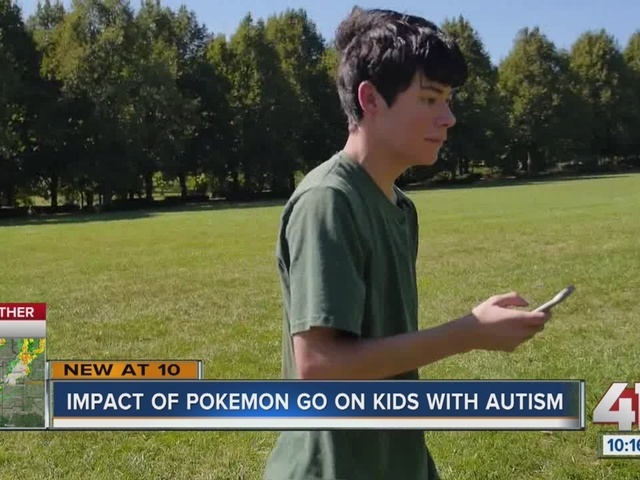 “I think we have to be careful saying “Pokemon Go” is helping children with autism socialize. What “Pokemon Go” is really good at is getting kids out of the house, it doesn’t promote true social interactions though and going back to the population of children we’re talking about who need to be taught social skills. And what a better way to do that with a game? Social intervention needs to happen,” said Allison-Burbank. Social intervention usually involves a parent or a professional helping the child. However, for kids like Harmon, the app is enough to get a conversation started.